We’re pleased to announce a new product line! The CellarCool wine cellar cooling units are now available. CellarCool’s cooling systems are designed to offer excellent cooling power and dependability, at a price that’s affordable for beginning collectors. They are available in sizes for cellars from 265 to 2000 cubic feet and start at under $1000. The CellarCool systems are designed for simple through the wall installation, but should not be vented into areas where the temperature may exceed 85 degrees since they have a 30 degree temperature differential. This makes them best suited for indoor installations. 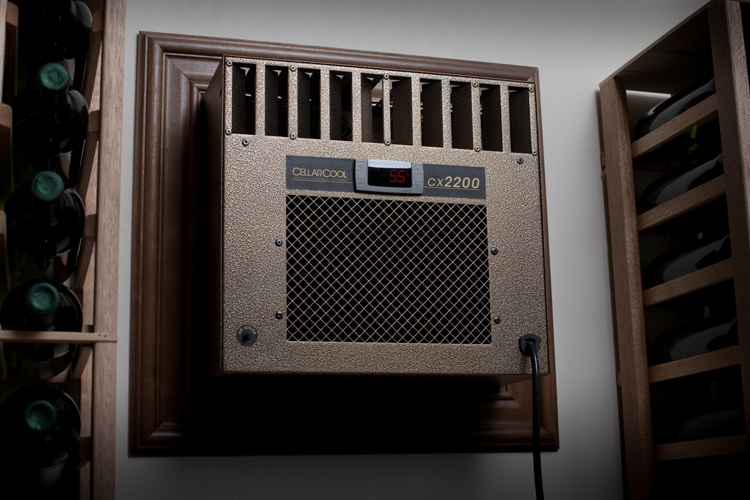 The CellarCool CX series maintains temperature with a digital thermostat control that’s easy to set and read. Four models are available for various cellar sizes, and since the units are built in the same size and shape as other popular brands, CellarCool CX cooling units are typically a direct replacement for Breezaire and Wine Mate cooling units. So if you’re in the market for your first wine cellar cooling system, or you need a solid and affordable replacement for your aging cooling unit, check out the CellarCool CX line of cellar cooling systems. Have questions? Leave a comment or give us a call–the Vintage Cellars team is here to help!